Figure 1 Liquid water in the past on Mars. 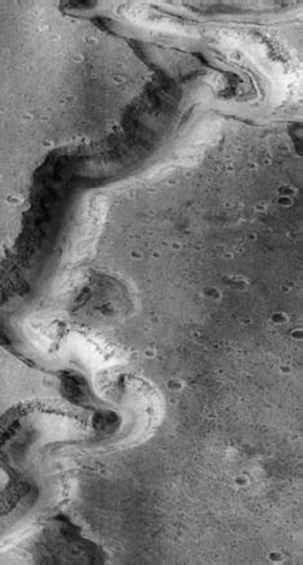 Mars Global Surveyor image showing Nanedi Vallis in the Xanthe Terra region of Mars. Image covers an area 9.8 x 18.5 km2; the canyon is about 2.5 km wide. Photo from NASA/Malin Space Sciences. ocean under its icy surface. There are two lines of evidence that indicate an ocean: the frozen surface of iceberg-like features and the magnetic disturbance as Europa moves through the Jovian field. The former indicates the depth to the ocean is about 10 km and the latter indicates that the ocean is still present today. Life on Earth may have originated in hot deep sea vents and Europa may have had similar deep sea vents, thus it is plausible that life may have also originated in Europa's seas. The same hot circulation could provide a continued energy source for life. Europa is more likely than Mars to have been free of any meteorites from Earth, so if there is life it is less likely to have been transported from Earth, hence more likely to be a second genesis. The ocean of Europa is difficult to access but if the linear features seen on the surface are cracks then these may be locations where water from the ocean has been deposited on the surface. Any life in the water would remain, frozen and dead, on the surface. Samples of this material might allow us to investigate the biochemistry and genetics of a second example of life.